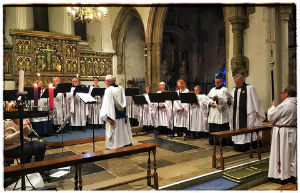 The choir leads the music in church every Sunday and on most major weekday festivals. It sings an anthem or motet every Sunday. New members are always very welcome.There is no audition but an ability to sight read although not essential is very useful. A commitment to sing on most Sundays is needed. Members of the choir cover a wide range of ages and children and young people are actively encouraged to take part. An understanding of the music we sing is an essential part of choir practice. Choir practices are on Wednesday evening from 6.30pm till 7.45pm. in church! We also rehearse at 9.00am on Sunday mornings for the 9.45am service. Please see Tristan Hall (choir master and organist) or contact Valerie Muller for more details.